StakeIt are a community-driven investment token allowing users to 'stake' their tokens on a daily basis without any token age or withdrawal limits. What started as a potential idea between Bitcointalk community members became a reality in November 2017. Our token sale ended successfully with over 2 million tokens being sold over a short period of 14 days. Along with our long-term staking options, we help maintain a healthy balance between demand X supply on the market through the token destroy plans. Earn STAKE through our arcade and affiliates system or simply, StakeIt! We welcome you to the world of StakeIt (STAKE). Stake your tokens without time or age limits. Our four different staking plans (Free, Basic, Premium, VIP) have been designed to bring you long-term profits. All revenues generated from staking fees & our 1-page ad platform are used to buy back & destroy the tokens. This continuously decreases the total supply of the tokens. 0 tokens for developers. Development fees are only funded through the initial amounts raised during the token sale. All Stake Reserve, Bounty, and Token Sale addresses are revealed to the public. Users can easily track any movement of funds with our public ledger available on our website. Earn 10% commissions for referring sales (lifetime commissions) and enjoy commissions from your referral's affiliate sales (multi-level marketing). Play arcade games and earn 1 STAKE per hour or simply double and triple your tokens through scratch cards and participating in daily raffle. Bounty & giveaways are held on the AD platform to attract traffic and advertisers. Advertisers can purchase ad spaces with STAKE. All tokens received from here are destroyed. 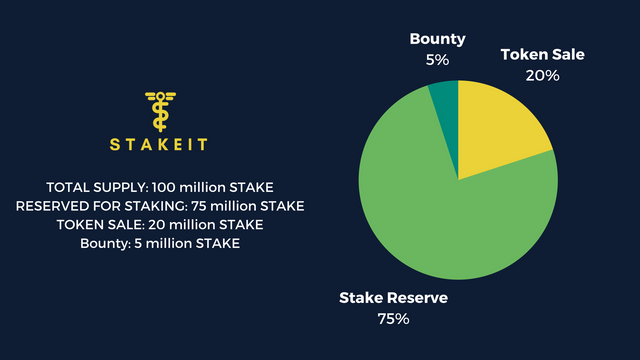 StakeIt Token (STAKE) is a community-driven project. Your suggestions and feedback will be heard and implemented as the project matures. Stake your tokens daily without token age or withdrawal limitations. StakeIt Tokens are community-driven ERC20 (Ethereum-based) Tokens. It's a simple community-driven token with great token staking plans. This is not an annual/monthly/daily staking plan. As soon as specified amounts from the Stake Reserves (75 million) have been distributed, staking rates of next tier applies.